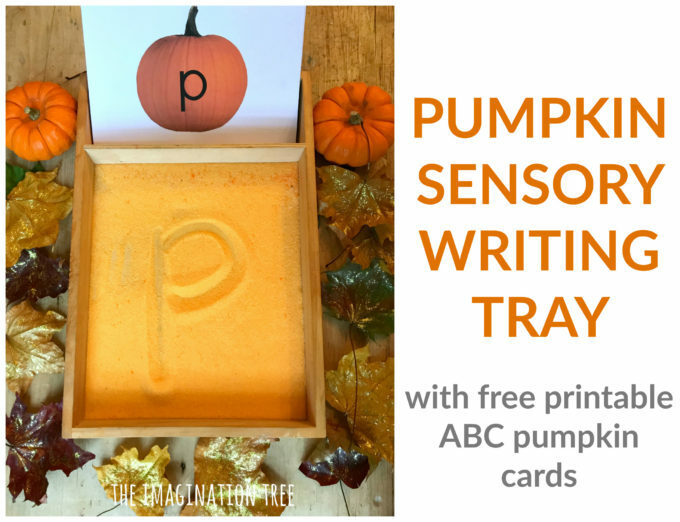 Make this pumpkin sensory writing tray using our free printable ABC pumpkin cards to encourage your child to learn the alphabet, their name and sight words in a fun, sensory rich manner! 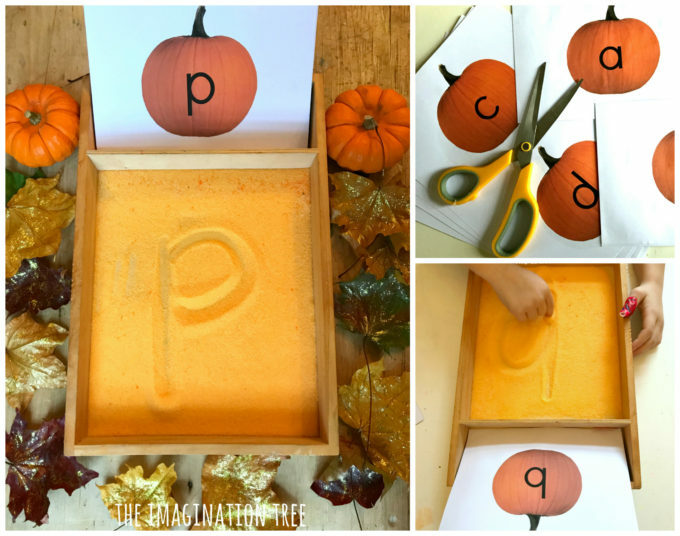 A perfect, playful literacy activity for Autumn or Harvest time! 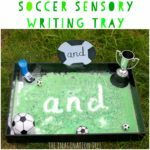 Sensory Writing Trays are something I have been writing about on this blog for a few years now and we absolutely love all of the possibilities that they offer for a truly kinaesthetic learning experience. 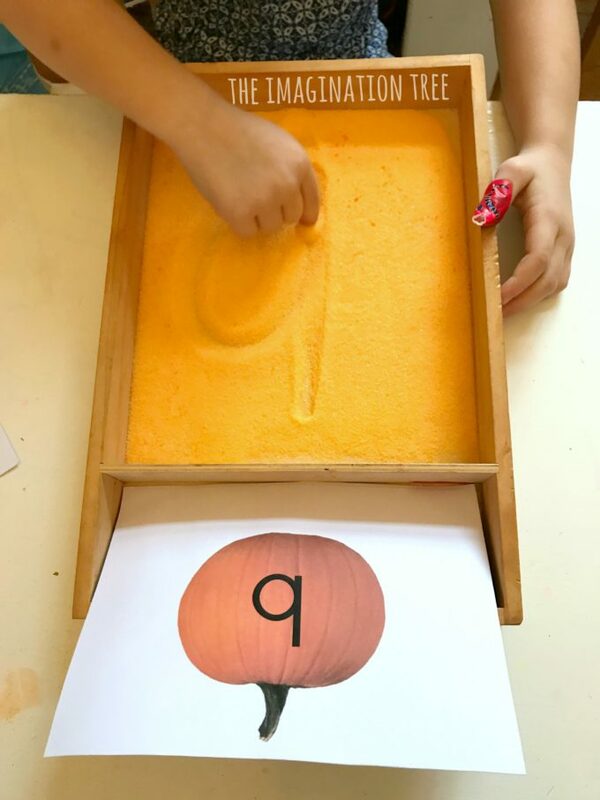 Children learn best through touching and moving, so creating the letters with your fingertips is the best way for the brain to cement new knowledge. Plus it simply feels lovely! 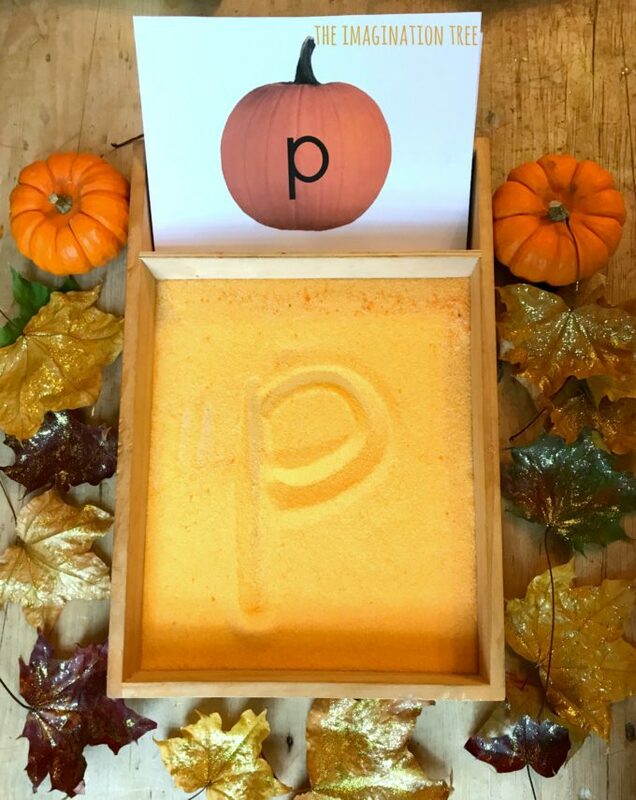 For a fun Autumn theme for October we made a pumpkin sensory writing tray using orange dyed salt. Simply add a small amount of liquid or gel food colouring to a small zip loc bag of salt, seal and mix the colour into it carefully through the plastic. Once the colour is thoroughly combined, either leave it in the bag to dry out overnight or tip it onto a plate to dry for an hour. You can sprinkle some cinnamon through at this stage for an amazing scent too. 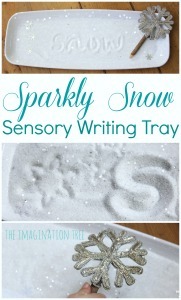 Once dry, tip it into a shallow rimmed tray and smooth over the surface by shaking it side to side. The salt should be no more than 1cm deep or else the salt will be too deep to make clear enough marks in. And cut them ready to use! It’s better to print them onto white card and preferably print double sided to save time and space too. Now write! 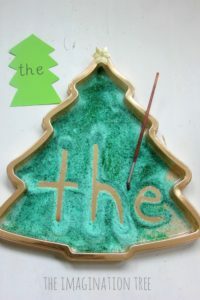 Copy the letters one by one, taking care to demonstrate the correct way to form each one. 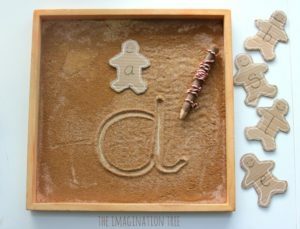 Now you could try creating small, 3 letter words by placing them together. 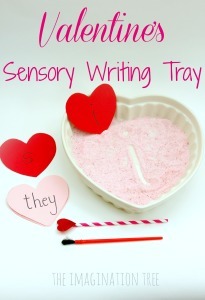 Ask your child to spell a word that you call out by using the cards first, then copying into the sensory tray. 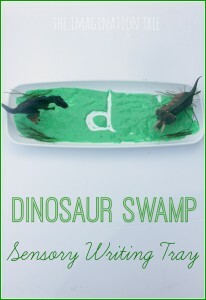 You could take it a step further and write your own sight word cards to be practised too. Miss 5 enjoyed learning how to form her letters correctly, then went on directly to writing sounds as I called them out, then blending them together to find what word it was each time. 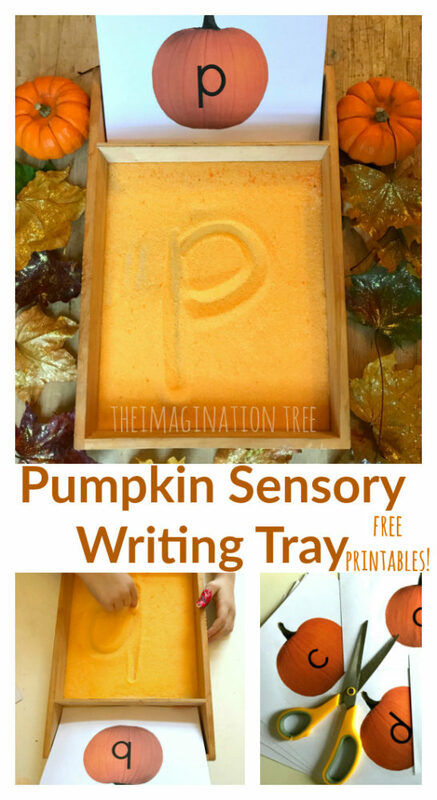 This is a reverse way to build up small words and read them too. 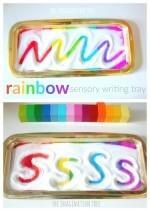 If your child needs to learn how to write their name then a sensory writing tray is a perfect place to give it a try. And our Christmas Tree themed one! As well as many more too! Want to start a new family tradition this year? 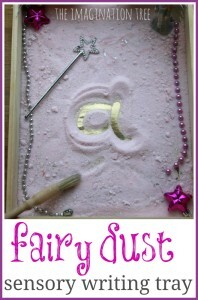 One that is fun, magical and encourages kindness in kids? Then our Kindness Elves are for you! 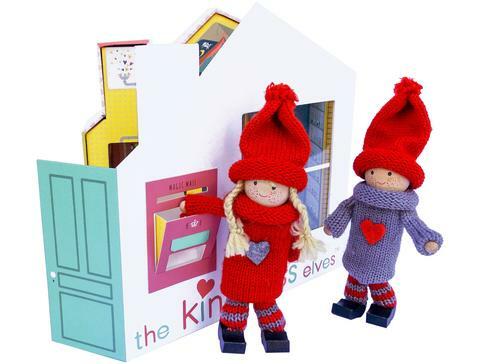 Hop on over to our other site, The Kindness Elves, to read the story of how I came up with the idea and find a book, Kindness Elves sets, accessories pack, teaching materials and more waiting to be discovered! Can’t wait for you to join us in spreading kindness around the world!